New data demonstrates that consumers are happy to make purchases within an app they’ve already bought. Indeed, that revenue is starting to dwarf advertising income. While the debate over Web ads versus app ads may be going strong, some new data from Flurry analytics may make it moot. The in-app purchasing game has taken off to the point where revenues from in-app buys are dwarfing advertising income–at least for apps on Apple’s iOS platform. Flurry, often a source of inside analytical data on smartphone apps, has a very challenging bit of data out at the moment: According to the graph above, there’s a massive swing in terms of smartphone app revenues. At the end of 2009 the greater majority of cash rolling in to developers from their carefully crafted apps came from advertising. But after a peak in ad revenues in December 2009, the pendulum swung to in-app purchasing, and revenues from ads slumped. By the end of this year, average monthly revenues per user will have doubled compared to 2009’s peak–and more than 80% of that will come from in-app purchasing. Flurry’s data covers a sample of “leading” apps on the iPhone and iPad, covering “social networking and social gaming applications” with a combined reach of more than 2.2 million daily active users. Flurry contends this is representative of the entire iOS app marketplace. Given the success of a similar kind of in-application purchase scheme–Facebook’s fledgling Credits system–it’s pretty plausible. There’s no option to buy in-app upgrades on the Android system yet, so Flurry’s data only covers iOS apps. Consumers seem happier to augment an app they’ve already purchased for a nominal fee–say upgrades to a game they already like playing–rather than pay top dollar for an app in the first place. In-app systems also allow developers to augment the way apps work. Apple adjusted the App Store protocols to enable in-app buying in October 2009, and it took several months for developers to implement the system in their software, and for these changes to be noticed by the app-buying public. Still, it was way ahead of the competition. Nokia revealed its Ovi store will gain in-app purchase powers (via cell phone operator payments) back in mid-September. RIM took a similar step at the end of September. Google is lagging far behind, and Android doesn’t support this system yet–which isn’t surprising for a company whose meat and drink is advertising. Given that mobile Web ad revenues seem to be far surpassing app-based income, and Google’s predicted mobile ad rates will quickly beat income from PC-based ads, in-app purchasing isn’t necessarily a priority for Google. 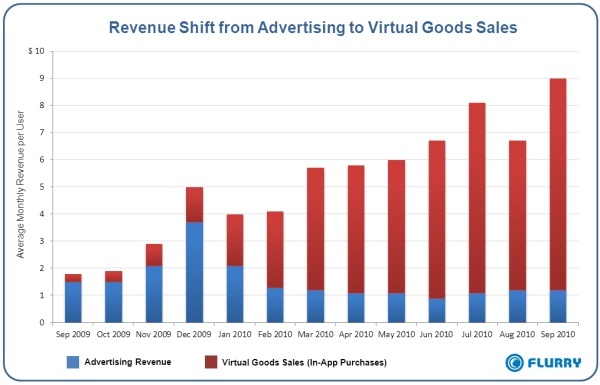 Revenues from apps are on a steep upward curve. As more of us buy smartphones, and learn to use them in cleverer ways, we’re spending more on apps–a fact that’s in conflict with some recent thinking about how much revenues apps generate. We can probably expect to be spending twice as much by this time next year…with lots of that cash going to in-app upgrades on software we’ve already bought.